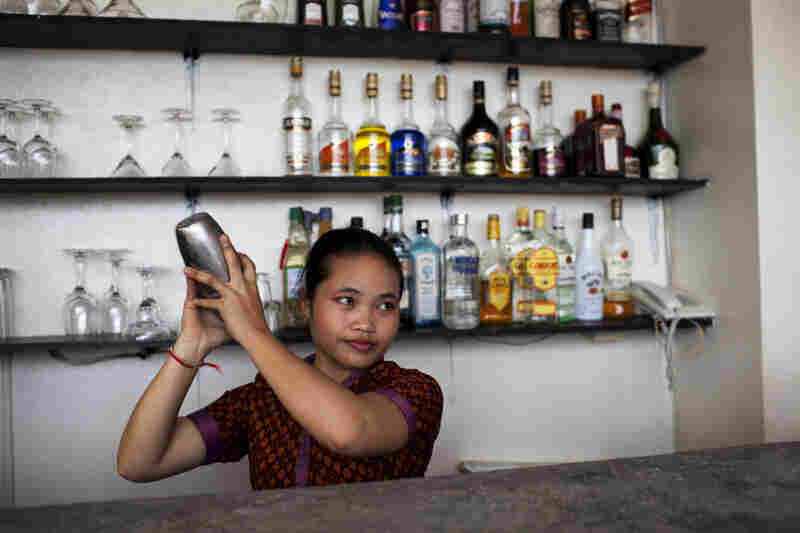 At Cambodia Hotel, The Workers Are The Boss Majority ownership of the Soria Moria hotel in Siem Reap now includes all 29 full-time employees, putting control of the hotel in the hands of workers who may have never had this kind of opportunity before. Traffic passes in front of the Soria Moria Boutique Hotel in Siem Reap, Cambodia. Kristin Hansen bought the Soria Moria Boutique Hotel with her husband in 2007. Four years later, they sold the company to their former employees. Hotel employees, including Yin Sochen (center), work behind the reception desk at the Soria Moria. The employees were resistant to the idea of owning the hotel at first but have since embraced the responsibility. Srey Tol (left) and another employee clean a room at the hotel. All 29 full-time employees co-own the Soria Moria. Khannika cleans up after the breakfast rush. Employees are paid double time after eight-hour shifts and receive four weeks' paid vacation, paid maternity and paternity leave, and generous health insurance. Lous Dalish shakes a cocktail at the rooftop bar. Employees earn shares in the new company based on a formula. Full-time employees earn 1 ownership point for every dollar's worth of salary they make. They earn two ownership points for each month they work at the hotel. Australian students drink cocktails while relaxing in the whirlpool tub on the rooftop of the Soria Moria. 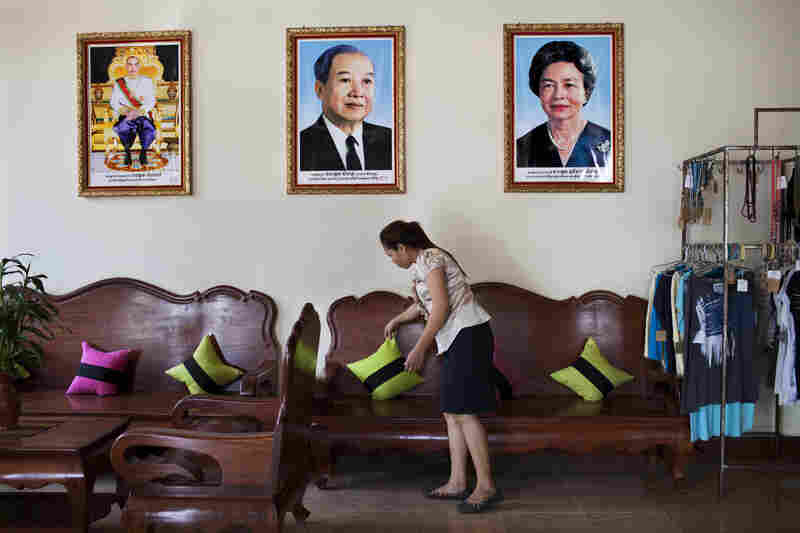 Photographs of Cambodia's royal family, including King Norodom Sihamoni (left), the late King Father Norodom Sihanouk (center) and Queen Mother Norodom Monineath, hang on the wall in the hotel's lobby. If you walk into the lobby of the Soria Moria hotel near the famous Angkor Wat temple in Cambodia, it probably won't strike you as a bold experiment in development and democracy. The Soria Moria, in the booming town of Siem Reap, is a three-star hotel with 38 rooms that is more cozy than fancy. It looks like a lot of hotels that cater to tourists: There's wicker furniture in the lobby, a rooftop bar serves margaritas, and the tile floors are spotless. "I work here as a receptionist," says Real Marideth, sitting behind the wooden counter. "I am the owner also." "I am food and beverage manager," says Eam Chandy, arranging buffet platters in the hotel's restaurant. "And the hotel owner." And talk to Chhan Voang, the doorman who is standing like a soldier just inside the lobby. "I am one of the owners of this hotel as well," he says through an interpreter. All 29 full-time employees co-own the Soria Moria. Think about it: Cambodia's a country where most people never got past primary school. They have grown up under dictators, in effect. Yet now the receptionists at the Soria Moria, the room cleaners, the bartenders and the office assistants have all become part owners of this corporation. Sim Sakana, who works at the reception desk, says becoming an owner has changed the way she works. "For me it's very important," she says. "Because we feel like this is our hotel. We try to be the best of the best." Still, the employee-owners have discovered that it's one thing for someone to tell you that you're in control, and it's another to truly believe and behave like it. 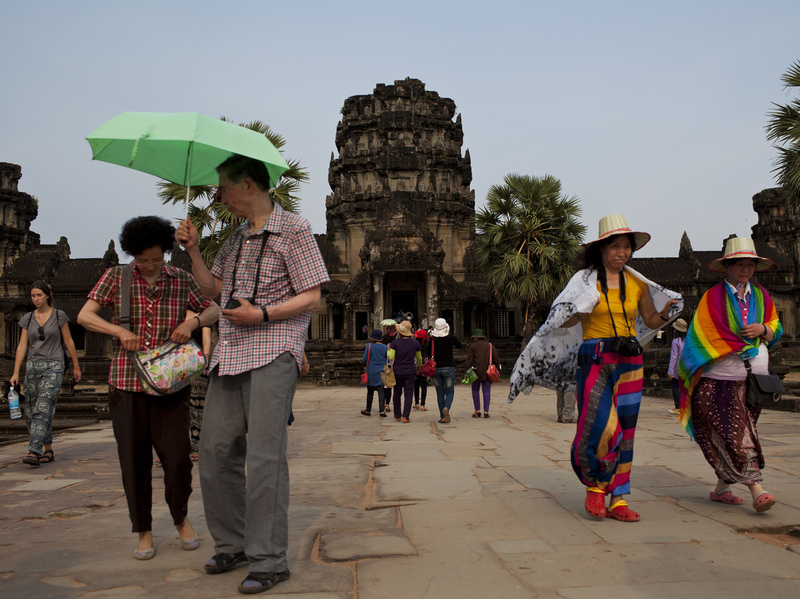 Tourists visit Angkor Wat in Siem Reap province, Cambodia, in April. The social experiment at the Soria Moria hotel is the brainchild of the Norwegian couple who founded it in 2007. They came up with the idea partly as an antidote to the side effects of booming tourism in Siem Reap, as visitors from around the world began flocking to the ancient temples. Investors from Korea, Japan, China and other countries were building hundreds of hotels in a town that was a sleepy backwater only a decade ago, with dirt roads and houses made of palm fronds. Those hotels were providing urgently needed jobs, but they often required employees to work long hours for little pay or benefits. "The thing is, I don't like to talk down other hotels. But I know there are cases where employees are being exploited," says Kristin Hansen, 33, the Soria Moria's co-founder. 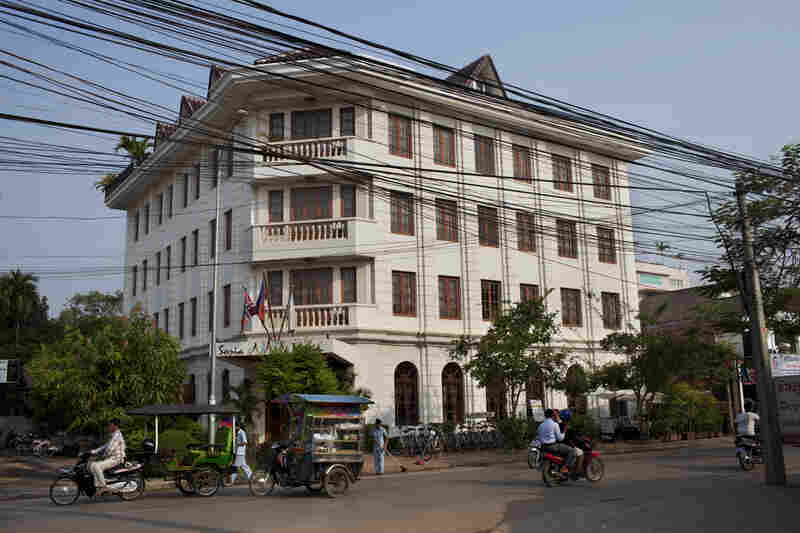 Hansen and her husband bought a long-term lease on an existing hotel after they fell in love with Cambodia. They changed the name to Soria Moria, which comes from a Norwegian fairy tale about the search for a castle and happiness. Hansen says they wanted their hotel to be a model of the right way to treat employees. "Sometimes they don't even pay employees; they just bring in poor people from the countryside to basically work day and night for food and accommodation. No salary," Hansen says. "There are many, many horror stories like that here." An executive from the Cambodia Hotel Association says he has heard similar stories. But, he says, most hotels treat employees fairly. Hansen and her husband wanted to treat their employees better. So they began paying double time after eight-hour shifts; they provided almost four weeks' paid vacation, paid maternity and paternity leave and generous health insurance. They have also paid for staff to attend college and graduate school. Then, a few years ago, Hansen and her husband started thinking about selling the hotel and moving back to Norway. They realized there would be no guarantee that a new owner would treat the Soria Moria's employees the same way. "And this started in my mind to form an idea that by the time we leave, we must make sure we hand over this to our staff, to our employees," Hansen says. "Because they helped us build the business, they should have this. Not somebody else." So three years ago, Hansen called the staff to the dining room.
" 'Would you guys like to be partners in the business?' That's what I said. There was kind of no response, and like, I think they thought we were joking. And then they got most of all scared," Hansen recalls. "Most of them are from farmer families; they've grown up living under the poverty line, living on less than a dollar a day. So to suddenly become a business owner, it's a big step." Hansen and her husband pushed the employees to take that step. They turned over majority ownership on May 1, 2011. Here's how the ownership system works: Hansen and her husband formed a new company on behalf of the employees, the Soria Moria Educational Development Program. Then they essentially gave that company 51 percent ownership in the hotel. Employees earn shares in the new company based on a formula. Day to day, the Soria Moria runs pretty much like a normal hotel: The managers tell employees what to do. But the staff is paid more than average for Cambodia — between $75 and $300 a month. And the employee owners get part of the profits. This past spring, each employee received between one and almost three months' extra salary from profit sharing. Hotel guests eating dinner in the dining room say they don't know the details of the Soria Moria's ownership structure, but they love the hotel's spirit. "You can see they are not exploited, and they are working for their own. And that makes lot of difference," says Joachim Pilzecker, from Germany. A British guest loves the hotel so much, he wrote a song about it. "There's a hotel you'll never forget," Mike Bishop croons. "They all work together for times you will treasure, Soria Maria forever." Hansen and her husband have discovered that it's one thing to give people power on paper; it's another thing to help people who have grown up poor and powerless to start behaving like they have power. Some employee-owners, for instance, talk about Hansen as if she were a benevolent monarch. "Kristin treat us like a family. Kristin love us and trust us," says Phhov Tol, as she mops a guest room. "Kristin always told us that everyone is the owner of this hotel, it's not her, so everyone can make decision." Tol pauses. "I'm not quite sure I'm smart enough." According to the hotel's ownership rules, the employee-owners vote on any decisions that involve spending more than $1,000 — such as buying a new refrigerator or building a swimming pool. And sure enough, when the staff started voting on decisions a couple of years ago, they basically rubber-stamped whatever Hansen said. "Cambodian people, they don't think they have the right to make decisions," says Ny Sandayvy, an interpreter who helped with this story. "Especially women. Because before, they never make their own decision. Most of the decision is making by their parent or husband," Sandayvy says. Hansen saw this problem, too, so she sent the staff to Possibilities World — a management training center in Siem Reap — to learn how to make decisions. During a recent afternoon session, about a dozen of the hotel's employees gathered around a conference table. "Today's going to be really important," said trainer Noem Chhunny. "We're going to learn accountability, responsibility to the whole team, not just individual success." Over the next few hours, Chunny led the group through a series of games, using props like ropes and hula hoops, designed to teach teamwork and trust. One of the hotel's receptionists said she was learning not to get angry and defensive when guests complain, but to focus instead on solving their problems. A waiter in the hotel restaurant said he had learned that he should face conflicts instead of running from them. "Last week I have a fight with a cook. Until now, I don't talk to him, and [he] doesn't talk to me," said Yuk Chhork, through an interpreter. "But now I realize that I have to change." Later, Chhork followed up and talked things over with the cook. But if there was one moment when the staff realized they do have control, it was probably their confrontation with Hansen over the staff vacation trip. Every year since they bought the hotel, Hansen and her husband would close down the hotel for four days during slow season, and they would take the staff to a resort — all expenses and their salaries paid. But last year, Hansen was worried they couldn't afford it because the world economy was shaky, and the hotel's reservations were down. So she called the entire staff to the dining room where she first asked if they would like to take over the hotel. And Hansen urged them to hold off on the trip. Yin Sochen is embracing his role as part owner of the hotel. Yin Sochen — the hotel's bright young bookkeeper at the time — stood up and told his colleagues that even though business was tight, the trip is the emotional high point of the year and the hotel could survive it. He urged the other employees to vote against the hotel's founder. "I am not afraid of Kristin," Sochen says today. "I stand up and I object to the idea because we are based on the majority. Lots of people behind me and support me." And then one of the women — Lous Dalish, a bartender — spoke out and urged her colleagues to vote against Hansen, too. "I am one of the owner. So I have the right to choose. I have confidence to express my ideas, to make decision," she says. The staff voted to take the trip. And the hotel did fine. Hansen acknowledges now that when the employee-owners voted down her proposal, she had mixed feelings. "I was a bit upset ... but I was happy as well. Actually, it made me really proud, I think, because I'm thinking like, they need to stand up for something," she says. "And there you go, they did it." Soon, the employees will really be in charge. Hansen and her husband have decided to leave Cambodia later this year and move back to Norway to be with family. So the employees will face a big decision: Should they sell the hotel and walk away with the profits? An appraiser said they could probably make at least $300,000. But some employees support a more ambitious idea: They want to expand and take over a second hotel.